Fedora release 28, audio-recorder Version 2.1.3. When the timer button is unchecked the record button still says "Stop recording" and the time is still counting. I suppose it should be "Start recording"? No, the GUI works just right. 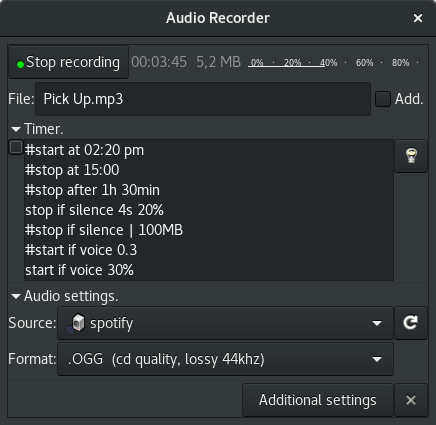 When the Timer-button is checked (active), the timer-commands can AUTOMATICALLY start/stop/pause the recording. When the Timer-button is unchecked, user can MANUALLY start/stop the recording by pressing the [Start recording] / [Stop recording] button.